Today is being hailed as an important day in the fight to keep the coordination of Clare Bus services in this county. A petition with almost 6,500 signatures has been delivered by a group of campaigners to the Dáil today, following outcry at an NTA decision to move some of its functions to Limerick. But assurances from the NTA have done little to allay concerns. The National Transport Authority has remained steadfast in its plans to move the coordination of the fleet of Clare Bus vehicles from the Feakle base to Limerick. 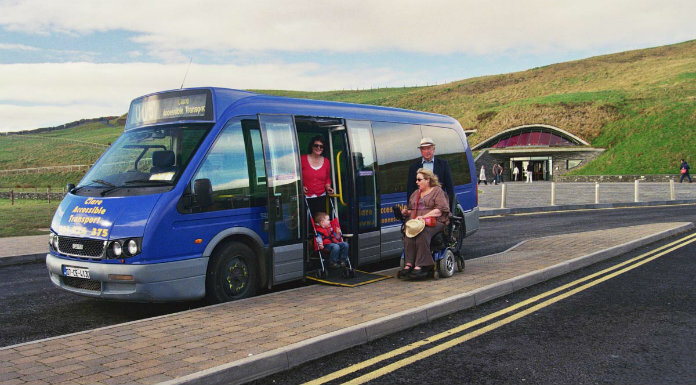 The NTA has this week reassured that there will be no changes to the existing services and the contract with Clare Accessible Transport has been extended to June 30th to allow the transition to take place. But despite those assurances, concern remains for the future of Clare Bus. Manager with the company Laura Ward says until they speak directly to the NTA tomorrow, everything remains up in the air. Today at 2:30pm, a delegation from the Save Clare Bus campaign group delivered a petition to the Dáil which has already received close to 6,500 signatures. The matter has previously been raised with the Transport Minister, who says it’s out of his hands as the NTA’s move follows EU regulations. But Fianna Fáil Councillor Pat Hayes, who has traveled to Dublin today doesn’t buy that – or the NTA’s reassurances. The petition has been handed over to Clare’s Oireachtas members at Leinster house at around half past two this afternoon, who undertook to forward it to Transport Minister Shane Ross. Now, the focus will turn to tomorrow when Clare Bus management will meet with representatives from the National Transport Authority, as they continue to seek clarity on their future.